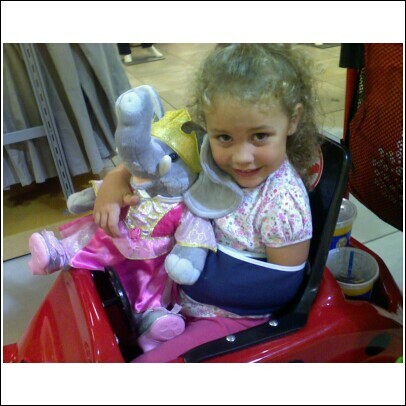 That's my niece Ashleigh, with her 'Build-A-Bear' (or in this case, 'Build-An-Elephant') and her arm in a sling. Her and her sister were playing on the stairs and Haileigh accidentally dislocated Ashleigh's elbow! No worries, it's actually a common thing in kids. So the next morning when they realized it, she got it re-located (?) and had to wear a sling for a day. Yep, just one day. That's how injuries go when you're 3. You or I would've been out for a month! This weekend we're finally staying in town, after being gone for the past 3 weekends in a row. Now I can finally catch up on all the things that pile up when you're gone. Like the laundry. It's all clean, but it doesn't like to fold itself. And Husband doesn't seem to like to fold, so I'll be plopped on the couch folding mucho loads hoping there's something good on tv for a good chunk of the day. Tomorrow I'll be doing a 5K in RTP (Research Triangle Park - where most of us drones work every week). There's also a 10 miler that Marty will be doing. I'm not expecting much for this race, but figured it would be a great opportunity to go out and get a good solid tempo run in. In other news, we've decided not to put our house on the market. Not that I ever talked about putting it on the market, but we've been looking at some houses in Cary and we were planning on putting ours up for sale. We want to get into a slightly bigger one with a garage, and prices are great. But, we finally decided that trying to sell our house now - with a much lower buyer pool right before the holidays kick up might not be the best time. We're not in any hurry, either. So we're going to hold off until the spring. Luckily, we don't need to sell our house for much more than we bought it to move into something bigger. That's because Marty analyzes everything and is a cheapskate (see previous post). Good luck tomorrow Bri!! Have fun!